Genius selects songs from your iPad mini music library that, at least in Apple’s not-so-humble opinion, go great together. To use it, either tap the Genius tab at the bottom of the screen or tap the Create button and choose Genius Playlist. What happens next depends on which way you started. If you tapped the Genius tab at the bottom of the screen, your iPad will display a collection of pre-made Genius mixes with names like Hip Hop, Classic Rock, New Wave, Punk, and so on, which are based on the songs in your library. 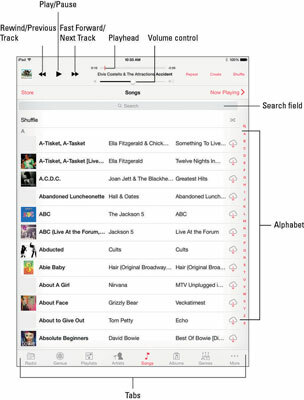 Tap one and your iPad selects 25 songs of that type that it thinks will go well together. If you tap the Create button on the main screen and choose Genius Playlist, your iPad selects 25 songs it thinks will go well with the current song. If no song is currently playing when you choose Genius Playlist, an alphabetical list of songs appears and you’ll need to select a song for the Genius playlist to be based upon. The less popular the song, artist, or genre, the more likely Genius will choke on it. When that happens, you see an alert that asks you to try again because this song doesn’t have enough related songs to create a Genius playlist. Refresh: See a list of 25 songs that “go great with” the song you’re listening to (or the song you selected). If you don’t like the selection, tap Refresh again and different tracks will appear. Keep tapping until you’re satisfied with the Genius’s choices. When you save a Genius playlist, it inherits the name of the song it’s based upon and appears in your library with a Genius icon that looks like the Genius button. And the next time you sync your iPad, the Genius playlist magically appears in iTunes. If you like the Genius feature, you can also create a new Genius playlist in iTunes and then sync it with your iPad.